Soak beans overnight in water enough to cover by several inches. In a dutch oven, saute bacon, onion, and garlic until the bacon renders and the onions are translucent. Add cider vinegar and reduce for 3 minutes. Add dijon mustard, worcestershire sauce, maple syrup, brown sugar, ketchup, hot sauce and stir to combine. 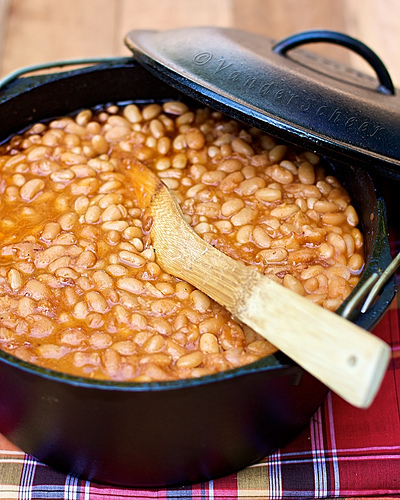 Drain beans, add to dutch oven with 3 cups water and stir to combine. Add salt and pepper to taste. Bake at low heat ~250F until beans are tender, ~4 hours.